Something sinister was moving through Hague Park on the night of June 6, 1923. Amusement park manager J. A. O'Dell and his wife heard something suspicious. The couple had returned to the resort around 1 a.
m. and were disturbed by the sounds of an intruder. O'Dell took a look around and then slipped back to bed. William Gamer also heard a noise and thought someone was trying to break into his place. Gamer lived above the ice cream stand, one of the many concessions he ran at Vandercook Lake. Gamer peeked out the window and saw the south end of the bath house in flames. He sounded the alarm -- fire in the park! The blaze was fanned by a southwest wind and quickly spread to the nearby pump house. The pump house had been specifically installed to protect the park in a fire emergency. Without it, they were helpless. The bath-house was a total loss after the Hague Park fire, with only its cement piers left standing. O'Dell put out an urgent call to the Jackson Fire Department. The request was denied because the City Commission forbade the department from fighting fires outside city limits. O'Dell pleaded in person at Fire House No. 5 on Rockwell Street. He rushed from there to the home of City Manager Charles Crary, who refused to overrule the commission's policy. Without city assistance, the resort was doomed. A bucket brigade could not stop the fire from leaping 50 feet to the administration building. From there, it jumped to the merry-go-round pavilion, skating rink, coal shed, and on to the hamburger restaurant. In less than an hour, seven buildings were destroyed. 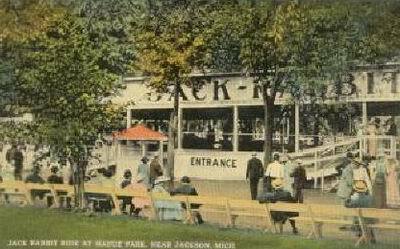 The Merry-go-round pavilion was one of seven buildings that burned June 6, 1923, at Hague Park. Losses were estimated at $175,000, including the new merry-go-round organ that had been installed the previous week. Insurance coverage had expired six weeks earlier. Thousands of spectators hopped streetcars later that day to see the smoldering ruins. Surrounding roads were blocked and Francis Street was a constant jam. All that was left of the bath house was its cement piers. The amusement rides and concessions that escaped the flames re-opened later that night. Arson was suspected but never fully determined. http://blog. 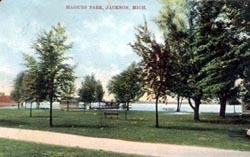 The Hague Park was on the east side of the lake where the County Park is located now. Hello, I do research and tagging for rcdb. I also run that website's Facebook page as well as the one below. Where exactly on the lake was the park located? Would like to tag the location for the database. Thanks, Derek. I purchased a large panoramic photo of an amusement park. 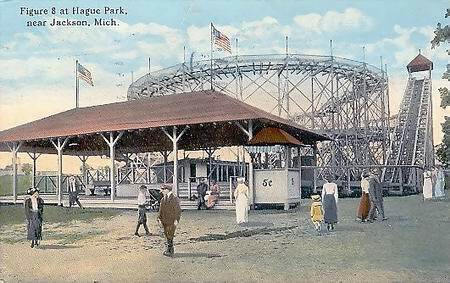 It was taken by a photographer from Detroit, but an archivist at Wayne State University assures me it is not of a Detroit amusement park. It has a roller coaster that looks very much like the one that was at Hague Park. Does anyone know if the park had a building with onion dome-style towers? I bought the photo just outside of Columbus, Ohio. 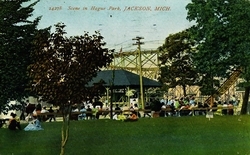 Since the park was purchased after the fire by a family from Columbus, that would possibly explain why the photo (if it is of Hague Park) wound up here. Does anyone know of any pictures from the Mill that was on Francis and Probert or the old house that was next to it. The Mill would of been on the other side of the bait shop. I RECENTLY PURCHASED A HOUSE ON THAT RIVER WAS WONDERING IF IT WAS HAND DUG THATS WHAT I WAS TOLD THROUGH SOME OLDTIMERS I KNOW GREW UP IN VANDY OLD MILL CREEK I BELIEVE IS WHAT IT IS CALLED. I was delighted to find this site on Hague Park. I have been researching the park as part of searching my family tree. My great great grandfather was Edrick H. Hague who developed the park in the early 1900's. My grandfather, Emmett Greenwood, used to tell stories of an idyllic life living and working at the park. His father died at a relatively early age so his family moved back to live with his grandparents. We have several family photos from that era. I would like to hear more from any of you who have more details about the heyday of the park and what happened to the property after the fire in 1923. I have completed a 500 page novel that incorporates one perfect day at Hague Park (July 4, 1912) as a central theme of a fictional story. It should go into publication soon. During my research I've talked to so many people that provided little snippets and pieces of information that have helped me (hopefully) recreate a perfect day there. If anyone has any other little stories or ideas, I would love to hear them!! What has been amazing are the urban legends. Where one person 'swears' the paddle boat was scuttled in the lake, another is just as sure it was sold for scrap. Where one group swears the Ferris wheel was lowered into the lake and now rests rightside up, another group maintains no such thing ever happened! It's been an amazing ride! If anyone has any thoughts or stories, e-mail me! LJ. I stumbled on this site while engaged in research for my latest book, a Route 66 encyclopedia. My grandfather was Frederick Hinckley of Hinckley Boulevard in Vandercook Lake. He either owned or was a partner in the bathing beach at the amusement park and I still have several of the bathing suits. The mill on Francis Street was his and it was a machine shop but I do not have information as to when it was built. My father, who still lives in Jackson, worked there as a kid. My understanding is that the stream it was on is actually a mill race. I spoke to my father a few weeks ago about this and he remembers a number of special projects, on contract, for Henry Ford that were completed at this shop. According to the information that previously have been posted. I take it that the roller coaster had fell into the lake, and some people on it was killed. Do anybody know if the track to the coaster had extended out into the lake. The picture displayed below does not show it going out into the lake. I have heard similar stories about the roller coasters at the Lake Lansing Amusement park, and the Lakeside park in Flint. 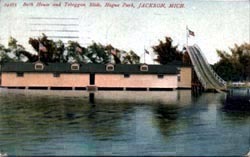 It is mention in a Merry-Go-Round up, a magazine publish by the National Carousel Association , that when the roller coaster at this park was torn down the wood was use to build the carousel pavilion at Lake Lansing. Do anybody know if there was a carousel at this park? The National Carousel Association is attempting gather information on carousels of the pass. Any information, and/or pictures of it would be greatly appreciated. Hi - I volunteer at the Jackson County Genealogical Society. We are working on a project on Hague Park. We are looking for pictures , scrapbooks , souvenirs , memorabilia , any old memories. I would really like to talk to Marc R. who grew up in Vandercook Lake in the 60''s and 70''s. Also anyone with info on the Hague , Emmons , James Albert O''Dell , Charles F. Gillespie and Eugene and Edmund Bethel families. 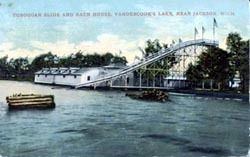 Thank you , Mark S.
The roller coaster is still there under the water at Vandercook Lake. I have a photo of some of my family but I don''t know who they are or where it was taken until I thought of googling the name of the boat where they were standing. It looks like a studio photo vs. the real thing. From the clothes on the women it looks like the early 1900s. Can any one tell me when this Hague Park was in operation. I see from these other chats that it was destroyed by fire in 1928? Thanks. email kjanway@att. net. We lived at Vandercook Lake when I was about 3 or 4 years old (1923-24) and I remember riding on the street car out Francis street from my aunt''s house in Jackson to the park where they turned around. Sometime during this time I remember the roller coaster jumped its tracks and ended up in the lake. A number of people drowned as a result. I metal detect as a hobby and belong to a club that''s based out of Livonia. I am an engineer. Is there anyone in this area of the park that would let me and two friends (or just me) to metal detect here? I have gotten permission to do churches, parks, and even ''hunted'' my own yard. I would be willing to show any finds to the property owner. Jeff/Ypsilanti. Avenue C has been paved for years. I lived on 5th st for many years, just one street over from park. During my digging and landscaping I discovered dozens of large bolts (1-2inches) that had been cut in half. Old gentleman accross the street told me they were dropped when they dissasembled the last of the parks rides. 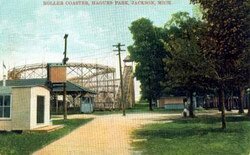 As a kid in the 50''s we played in the vandercook county park daily and we had no clue that an amusement park had been located there. The large concrete structures in the water were just diving platforms for us. Jim. Looking at the pictures that I have I believe that the boat house was at the south end of the park where the dirt road curves around down by the lake, I think it''s called Ave C?? and it was dirt the last time I was there. To answer a question that I read earlier the sight seeing boat R. E. Emmons is not in the lake, it was sold for scrap during the depression. I grew up in Vandercook lake in the 60''s and 70''s, spent alot of time at the lake and used to listen to the old timers tell stories about the park there, they told me at one time it was called Wolverine Park. I lived in the subdivision behind the church on Francis and Probert road, thats where the old Girl Scout camp was, we knew every inch of every trail that went thru the camp. We spent our summers terrorizing the poor girls who would come there to spend a week. From what I remember there was a mill on the creek there at francis and probert, on the opposite side of where that old closed bait shop is (or was) not sure if the shop is still there, have not been thru there in 15 years. I have collected cards from Hagues Park for years and have most everything from the interurban garage in jackson, to the photo shop souvineers at the park, anyone remember when the interurban tracks used to run down the middle of Francis ? thats why that street has a grass median in it. I was told about a old saw mill on Francis and by Probert. I know that there are some really big pillars still in the water sticking out. Would anyone happen to know about that? If so please let me know?. 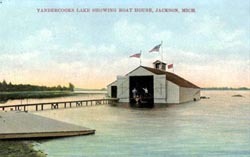 Does anyone know where the boat house was located on the lake? I see all the pictures that show the dock and house but there are really no landmarks to show its location once you actually go to the park. Thanks, Jim. 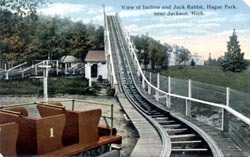 The postcard picture that shows the toboggan slide that is here on this page I just say it listed on ebay the starting price is $9. 50 if anyone is interested I just thought that someone might want it. What a history Vandercook Lake has. I grew up on Hague even went to school with the Lee kids mentioned in a previous message, I knew Vandercook Lake had a history, but I didn''t know the park was as big as it was. As a kid it was not an uncommon site to see people with metal detectors, even in the lake. They pulled up crusted over change, buttons, and rings. As interesting as the park was, I wonder if it had anything to do with the caverns and caves. I lived on Vandercook Lake ever since I was 3 years old. My Grandparents lived on the other side of the lake. They were Oatley & Barbara Wood & Oatley and Jessie Wood. I have a picture somewher of my grandfather standing on the ferry that took people around the lake. Not sure just how old my dad was when him and my uncle use to ride the trolley car from town out to the lake before my grandparents lived on the lake. Our house was 3 houses from the park and the road use to run along side it. When I was 3 1/2 years old on the weekend in the evening a car came racing down the road called Lakeshore Drive and almost hit me. So my dad and a neighbor named OB Reynolds put up a fence and the road was closed off and then i guess they went to court to have the fence left there. When I got married my & I husband and I bought the House next door to my parents. When we would dig in the yard we found lots of old bottles and spikes and misc. things that were from the old bowling alley I was told that was in our backyard. We lived next door to the Lees. Ellen grandfather was a Cure and he owned most of the land around Vandercook Lake. I still live in Vandercook and I guess always will. There were many drownings that I can remember and one I personaly dove down and brought up a 5 year old little girl that we could not bring back to life. The other little girl lived. It still syas really fresh in my mind today ! People at the park dont know the lake well ,and they dont watch there children well. Little ones use to wander in our yard all the time and my mom would find their parents down at the park sleeping in the sun. 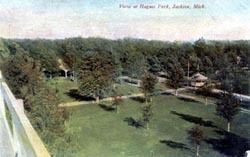 My grandpa and Dad always said that Hauge Park was a grand park in its day !! We had an old movie film that my dad took one time ,in it the DNR used netting and removed many many carp from the lake. They draged the net up to shore and threw the good fish back. Also one time they had a big crane down by the boat launch that brought up old antique cars & trucks and a man took pictures of them and then put them back in the lake. When I was 5 years old I remember the circus that came to the park. It was so exciting to get up and see elphants drinking from the water. 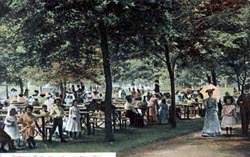 Kathleen, I love the postcards of the old Hague Park. 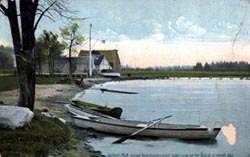 My mother has a house on Vandercook Lake and I would love to enlarge the postcards and put them in a frame for my mother to hange on her wall. Is there anyway you could send me better pictures of your postcards? Chris cjboback@msn. com. 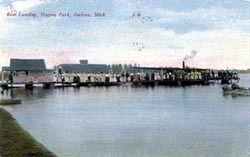 I researched the steamboat at Hague Park. I am the history writer at the Jackson Ciizen Patriot. The boat, the R. E. Emmons, never went to the bottom of the lake. 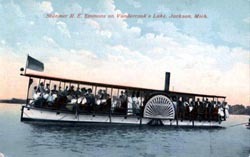 The owners, (father-and-son team of Eugene and Edmund Bethel,) sold the boat along with the House of Fun to Charles Gillespie of Jackson. This was during the late 1920s or early 1930s when the park fell on hard economic times. The wood was salvaged to build docks and porches on the lake. Part of it was used to build a section of a house at 517 Cass Ave in Vandercook Lake. The boat and Ferris Wheel are not in the lake. That is just local legend. I live at Vandercook Lake in what was supposedly the main office for the park. According to a scuba diver who has been all over the lake, the old steamboat is NOT down there. One of the pylons that the coaster was on still stands. 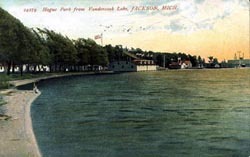 I have several old post cards of the park. I would like to see more pictures if possible. Wait a mintue, There was a whole park in Vandercook Lake?? I thought there was only one roller coaster in a community park. Thats amazing I really wish that they would rebuilt this, I would like it. I grew up on this lake. Myself and others had always heard the sinking stories. After several summer seasons of very foolish diving, we did find them. For me, it was the closest I ever came to not making it back to the surface. It was so cold down there and what I saw was what I believe and Mr.
Beaman who was the caretaker later in the 70s thought it must have been part of the ferris wheel. It was most of a car and had the surrounding bars of attatchment. In the early 60s you could still see two grouping of racks and a couple of deteriorating pilings nearby. As I look back, I understand the misconception of invincibility felt by youth. My siblings and I were present and helped with the searches for several drowning victims. There is a large drop-off area that has undertows in this lake. Even experienced divers have had challenges there. By this time, I cannot believe the sunken structures are more than total rust which would absolutely call for diving gear to scout out. It is hard to really envision these up and running, right there. The music playing and ladies w/their beaus strolling along, as we see in the old postards. It would probably be just as difficult for any of those folks to comprehend what Cedar Point would be if they were given a few photos! I ve started collecting these postcards and am happy to see that I have several that have been added to this site. Does anyone know just how the park was set up. given what still (?) exists, say the spring pipe? (that ran 365/24/7 and had (has?) the best tasting water around. ) It would be great to know! Thanks for the chance to do a little rambling. 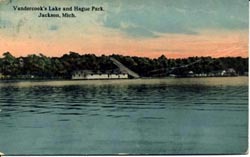 Its been rumored that the old paddle boat was sunk in Vandercook Lake and is still there, although nobody has been able to locate it. 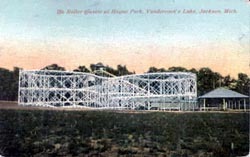 The park burned down in 1923 and was never rebuilt.